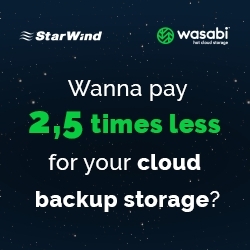 Middleton, MA, January 22, 2019 --(PR.com)-- StarWind, a leading provider of hyperconverged IT infrastructure for SMB and ROBO, and Wasabi, the hot cloud storage company, announce the launch of a joint solution for a secure hybrid storage and quick recovery of company’s backups and archives. - Simplicity: seamless integration into existing backup infrastructure. Companies don’t need to change their current backup and archival processes. - Reliability: automated backup process and secure storing in the cloud. Once uploaded to the cloud, the data becomes immutable to ransomware and malicious or erroneous actions. - Recovery: fast disaster recovery. Restore processes become a matter of few clicks. - Scalability: extra storage space is added on demand. IT managers don’t need to provision storage to grow into it. - Cost: instantly accessible hybrid storage pool at bargain price. The solution requires minimal investment and becomes even more cost-efficient as a company grows.